1. Who makes the best MP3 Player? 2. How many MP3 Players have you owned/currently own? 3. Does your MP3 Players play video? 4. Does size matter? What size is your MP3 Player? 5. Do you use your MP3 Player as a portable hard drive (to transport files other then music or video files)? 6. Is your MP3 Player your smart phone? 7. Dream of a future feature that might be on the next/later generation of MP3 players. What would that be? 8. Any MP3 Player horror stories? Toilet drops? Kidnapped by fiendish greasy-fingered thieves? Ever have to kill a man with your knockoff iPod Shuffle? No. I only use it at home, anyway 1 3/4 x 3 1/4 x 5/16 - all in inches. It's dumb as a rock. How about a slider that would let me move backwards within a track? I wouldn't mind being able to start anywhere within a playlist and have it move through the various tracks in sequence. Mine shuffles with or without shuffle being on. MP3 is not my defensive weapon of choice. I guess Apple but then again I have no other experience with any other brand. 2. How many MP3 Players have you owned/currently own? Only one. Yep. Nice little screen though I have yet to watch an entire film on it. So far, 8 GB's seems fine to me. It's just a 3rd Generation iPod Nano. Would teleportation be too much to ask? Also an easier and more accurate way to rewind in podcasts would be nice. So far, lightning hasn't struck yet. Apple has always had a good emphasis on the user-experience, but their mp3 players were not superior enough to competing offerings to overcome their closed nature (e.g you have to use iTunes to load your iPod). However with the avent of the iPod touch their superiority over other players is now a matter of them being a vastly different device. 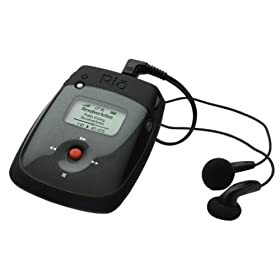 It's not just an mp3 player, it's a 1999-era computer in your pocket. Right now, the iPod touch is a no-brainer, but the iPhone was created for a reason. The phone will be the convergent device. People aren't going to carry a phone, a PDA, a digital camera and an mp3 player when it can easily all be one device. So with that in mind, I'd say the best mp3 players right now are the iPhone and their main competition will come on the phone platform (e.g. the Nexus One has better hardware than the iPhone right now). I've owned dozens, right now I'm not sure how many I own (I have a lot of old mobile gadgets in a box, most play mp3s) but I really only use my phone for a portable mp3 player. Yeah, but I'm not that into that. Both physical size and storage capacity are some of the key factors in a portable mp3 player for me. Right now my phone is 8GB and I am constantly removing apps and don't have enough space (I'd love to spring for a 32GB new iPhone right now, but that would set me back over a grand down here in Costa Rica and my newfound fiscal maturity is getting in the way of my inner geek). No, the cloud pretty much killed my need for portable storage. Right now the key is having a data connection and your files on the web and they are available everywhere. The death of the mp3 format and the adoption of a superior, open-source, format. Right now mp3 is not the best option for music quality, but it's the best option when it comes to music portability (everything plays mp3s but no other format is as universal). I once walked into a favela (shantytown) with one, and some drug dealers tried to rob me (they were new at the time). But others intervened and told them that I was from a nearby neighborhood and you just don't go cannibalizing your own hood (honor among thieves). I eventually became friends with them and gave one of them the player when I left town. If your mp3 player lacks that slider (others have it), you might want to try holding down the button you use to skip to the next track, a common design pattern is for that to serve as a fast forward within a track. Does it have a video display/screen on it? 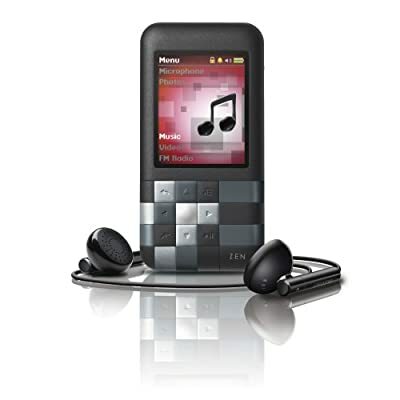 Went ahead and just bought a Creative Zen Mozaic 16 GB MP3 Player (Black). Praise be to Amazon credit! I wish you luck. That keypad might have been designed by Rubic. 2. How many MP3 Players have you owned/currently own? 2 in total. 1 right now. 4. Does size matter? What size is your MP3 Player? 8 GB. the real size issue is the actual player. It's too small. I keep losing it inside my knapsack. Previous one, 20gb, currently 1gb, 8gb. Greater clarity of screen, bigger writing, so I can see what I'm doing. Like Roger, my shuffle is not weapon of choice. Previous MP3 player died as I was coming to the end of my Italy trip. It just stopped playing. No music for the 26 hour flight home Waaahhh!! I'm re-loading both ipods for my next trip. I use it totally to plug into the cheap boom box on the patio. I like it fine except the instructions that came with it were less than useful. Apparently either I lost my MP3 player this week or it ran away from home! I'm don't plan on buying this guy again. I have had my zen for 3+ years. Im hard on it, and it has stood up over time. I will never buy trendy brands like apple. Too closed . No way. With mine I can pop in a memory disk and add another 8 gigs of what ever i want. movie, music etc.. Even the glowing reviews on sites like Amazon and electronic review sites like CNET complain about the Creative software. Plus I'm not too keen on the sound quality. It's good but I was underwhelmed with the output considering it's from the legendary sound card company ~ Creative Labs. The newborn Nano's! They're so bloody adorable!